The Electronic Recycling Association proud to partner with local recyclers to properly dispose of non-reusable e-waste. Calgary, AB (August 3rd, 2018) – The Electronic Recycling Association (ERA) has been working to reduce unnecessary electronic waste since 2004 throughout Canada. Many of us are unaware of the toxic chemicals that derive from electronic devices. Take a cell phone as an example, it has over 500 components and many contain toxic metals such as mercury, lead, beryllium, and cadmium. ERA work with Alberta Recycling (ARMA) certified recycler, Hi Tech Recyclers creating a more sustainable environment. Both parties have one goal and that goal is to ensure that electronic waste is properly taken care of through processes put in place by them directly. Over the past five years, the ERA has worked with Hi Tech Recyclers to dispose of 700 tons of e-waste from Alberta alone. The e-waste that was safely recycled within the province comprised of unusable TV’s, printers and electronics that could not be reused. Established in 2004, ERA is a non-profit organization directed to reduce the environmental impact of improperly discarded toxic electronic waste by offering accessible services to help corporations and individuals manage their retiring IT assets. Through industry-leading pickup, data removal and reporting/certification services, ERA provides a full-circle solution for e-waste management. With reuse being ERA’s top priority, every item that is received is examined for any remaining productive life and refurbished for reuse. True end of life items are transferred to accredited Canadian recyclers where a nil landfill contribution can be assured. ERA is committed to supporting local charities and individuals in need through the provision of electronic equipment to charities and individuals alike. 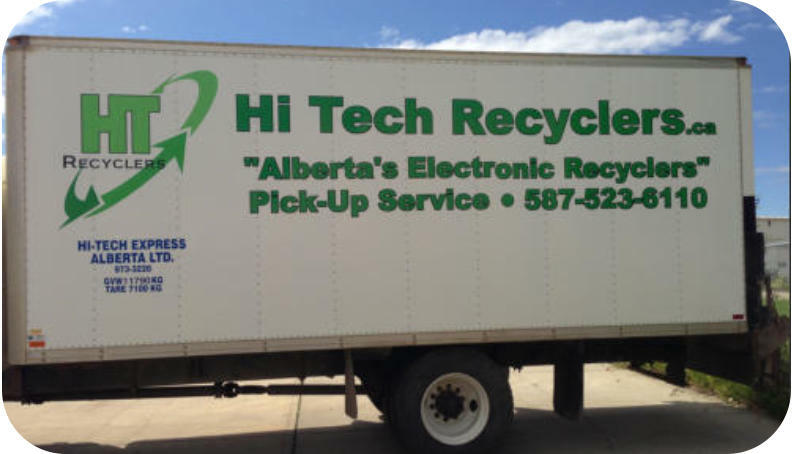 Hi Tech Recyclers are Alberta’s newest electronic recyclers. They are an Alberta based company, locally owned and operated out of Edmonton, Alberta. They aim to have the best customer service in the electronics recycling industry. Hi Tech Recyclers facility is secured for your data protection. Everything they receive is inventoried immediately. Each component is then dismantled, shredded, and shipped to an approved downstream processor. The components are then manufactured into new products to guarantee no electronic recycling ends up in landfills across Canada. Also, since many electronics have hazardous materials they strive to keep electronics from polluting our landfills for future generations.